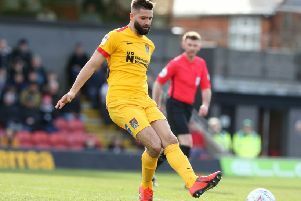 Cobblers boss Dean Austin is expecting a tough test when his team walks out at Field Mill for their Sky Bet League Two clash on Saturday (ko 3pm). On paper, the match looks like a great chance for Town to close to within just a point of one of the teams not too far above them in the table. But closer inspection of the Stags’ form shows a team that could so easily be right at the top end of the table, had they enjoyed a slice of good fortune here or there. Mansfield have lost just one of of their eight Sky Bet League Two games to date, but they have also won just twice. If they could have turned just a couple of their five draws into victories, then they would be in the play-off positions, and Austin can see similarities between their season so far, and the Cobblers’ stuttering campaign that has promised plenty at times, but so far delivered very little. “Mansfield are a decent side, and as a club they are obviously very ambitious as they have a massive budget,” said Austin, who has seen his team win just one and draw four of their opening nine league games. “They are probably a little bit like ourselves, in that watching some of their games they have played quite well and dominated at times, but not taken their chances. “They have opened teams up at times but not made the most of it, so they are very similar to us in that sense, and it is going to be a stern test for us. “But it is one we are looking forward to. Barring any fresh injuries picked up in training, Austin is likely to go with an unchanged team for the clash with Stags. Town secured their first clean sheet of the season in last weekend’s 0-0 draw with Notts County at the PTS Academy Stadium, and although Aaron Pierre is available again after suspension, Leon Barnett will keep his place in the centre of defence.